80m QRP 4600 mile skip? I am still relatively new to operating QRP and operating on 80m. I made a few SKCC contacts last night and had a nice long ragchew with Mark (W1AAF). When I was shutting down my station I looked at my browser window displaying the Reverse Beacon Network and was surprised to note that my QRP CQ on 80m had being reported by RBN stations in Europe. The reporting station in Slovenia was over 4600 miles from me! I have not seen 80m skip like this from my station so this was new to me. I have made some cross continental contacts on 80m but never seen it go 4600 miles to the Northeast before. I'm used to that from the higher bands but not my NVIS 80m antenna. This got me to thinking about my 80m OCF Dipole which has been a good performer for me especially to the North and West but generally poor to the South. However a couple RBN reports also showed my signal as strong as 22db to Puerto Rico and Curacao last night so some sort of 80m propagation pixie dust was being spread around. 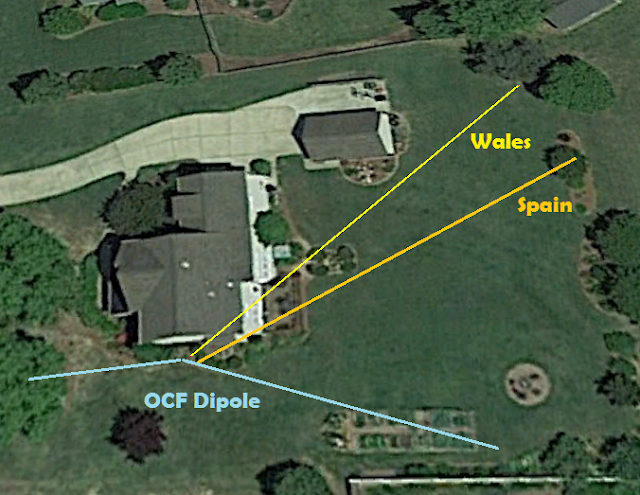 Below is a satellite view of my QTH with the layout of my OCF Dipole shown in blue and the direction of propagation to the Wales and Spanish stations super-imposed. My OCF Dipole is not straight across. It is bent about 25 degrees as you can see due to my anchor points. The long end slopes down to about 10 ft above ground while the apex is only at 25 ft tied off to the peak of my roof. The short leg heads off level to a tree in the front yard. So 25 feet sloping down to 10 feet is certainly not an ideal height for 80m so the take-off necessary for the skip to the distant European stations is very surprising to me. This antenna has been a good NVIS antenna for me on 80m and a relatively good DX antenna given the recent poor band conditions on 17m and 15m. Even though I normally operate QRP or sometimes up to 10 watts I nearly always get a signal report that is either equal to or only one S-unit lower than the QRO stations I qso with. I have really been puzzling over this antenna lately trying to figure out why its SWR is so low on so many bands. It shouldn't be this good. And if something seems too good to be true it usually is. Low SWR doesn't always mean antenna efficiency. When I measure the individual sections of coax connected to this antenna they have SWR and reactance issues. I still use an old run of coax that comes back into the house that has problems due to a previous lightning surge that was strong enough to melt the solder connections in my spark arrestor so I know things are amiss. Yet overall SWR, impedance and reactance through all the components connected together is very low on most bands. The key seems to be my station ground that is nearly resonant on 20m and runs around my house and up to the 3rd story operating position. The long electrical ground has certainly become "part" of the antenna system, yet I'd expect it to introduce a lot of loss as it ties into 3 ground rods. But it's nights like this that keep me from "fixing" it. I did finally replace the coax run back into the house as it turned out that coax braid was damaged. The result was that my Windom was no longer 1:1 SWR and showed more expected SWR readings. It's still 1.7 SWR or lower on all the bands except 10m and 6m where it's SWR is 2:1. So that's likely a more normal response. The antenna is also quieter now with the replaced coax so all is well.